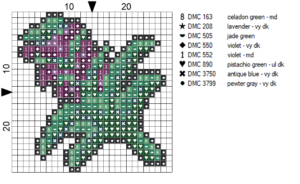 So you want to make your own Cross Stitch patterns. Good! We need more creative people coming up with all sorts of neat designs! 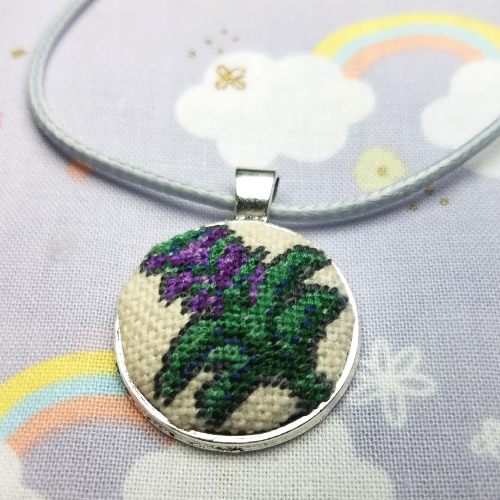 It’s fun, rewarding, and there’s nothing quite like the feeling of finishing up a design made entirely by you, or seeing other people stitch your art! 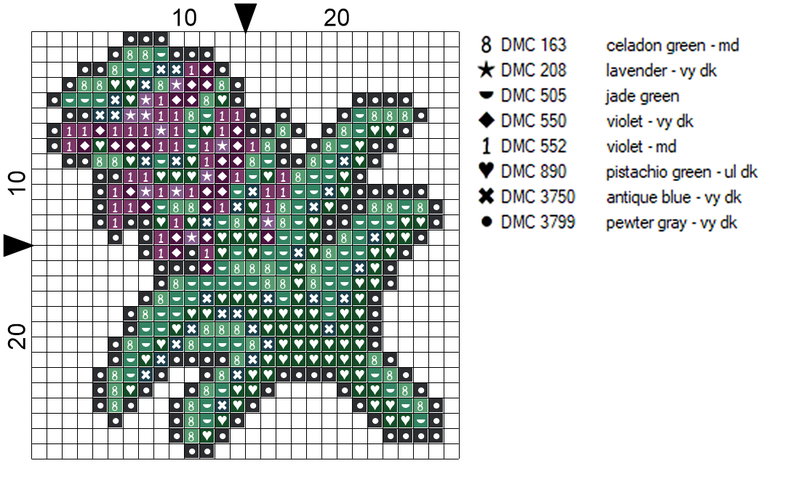 I’m only really familiar with PCStitch, so that’s what I’ll be explaining. 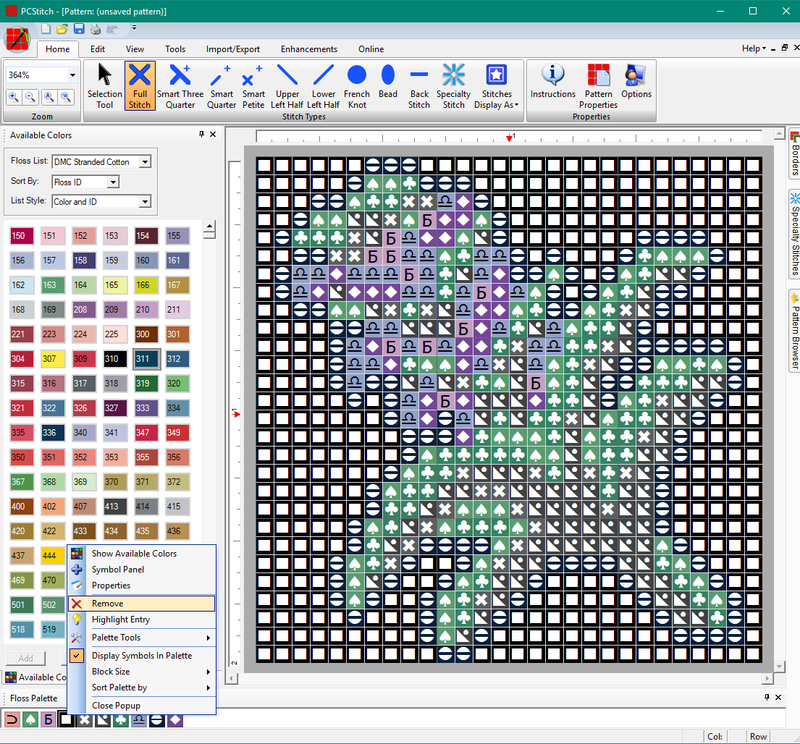 But WinStitch/MacStitch and STOIK are also great programs with similar functions, so don’t be afraid to try those out as well! I’m not going to be super thorough on each of these features, I’m just going over the general steps to consider when creating a design. Additionally, this is only my process and it is not the only way to do things. Please do experiment and find the process that works for you! But as I get tons of questions on my process, I figured it was time to write it down. 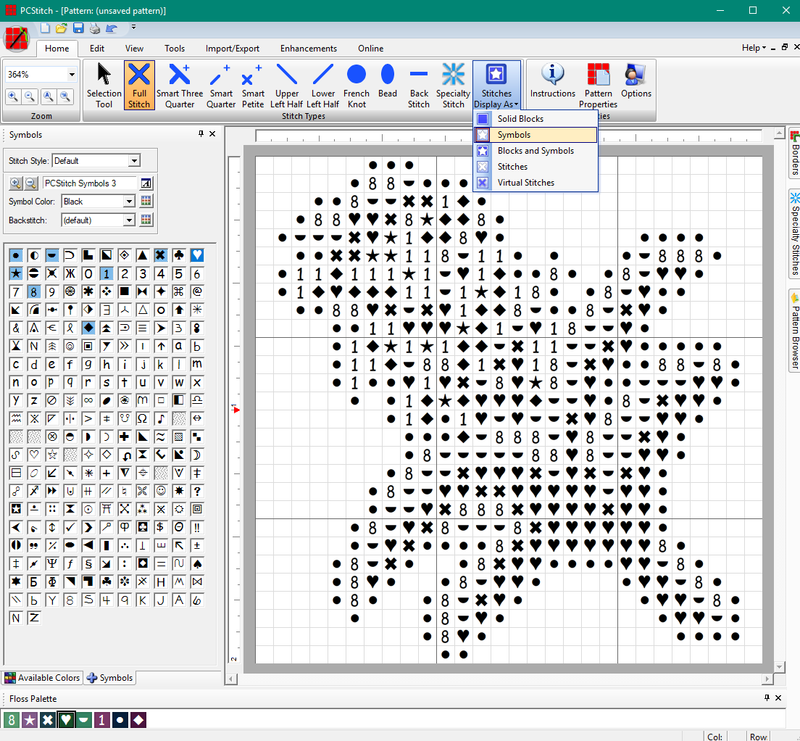 Ideally, you are turning your own unique artwork to turn into a pattern. But also it’s fun to get game sprites or existing images and stitch them as well. So no judgment here. 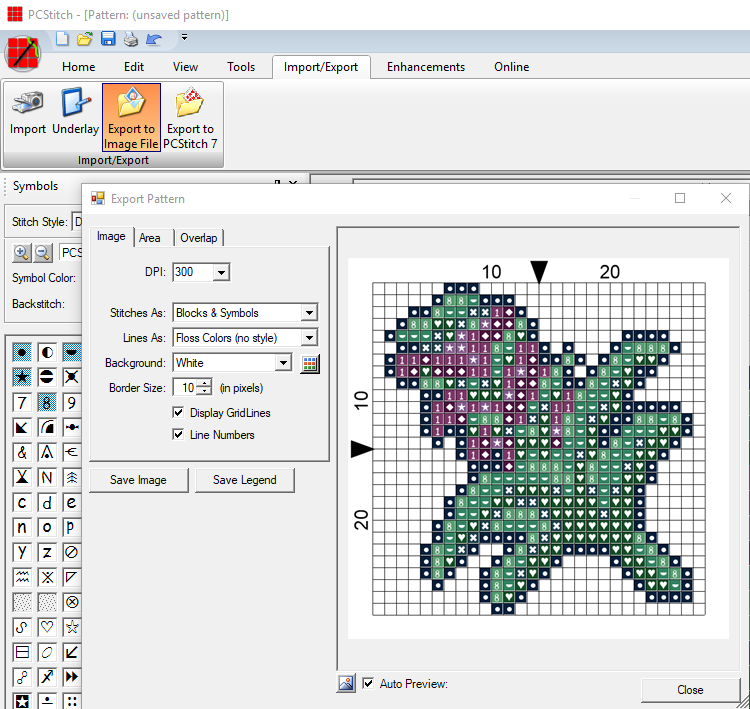 For video game sprites, I’d recommend going to The Spriters Resource, looking up your favorite game and skipping ahead to the ‘Importing into PCStitch’ section. 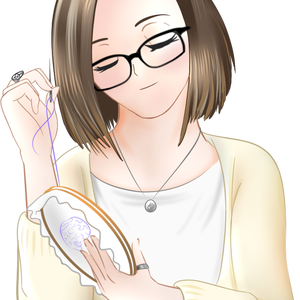 If you just happen to find cool pixel art online (or any art), I would recommend asking the artist if they’re okay with you stitching it before going through this process. It’s simply polite, and usually they’re more than excited that you even want to. Oh. Well that’s… kind of boring. 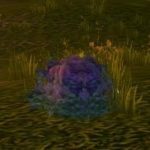 I don’t remember picking blobby purple masses in game. Let’s use the inventory icon instead. There we go. That’s what my brain associates with the kingsblood plant. Let’s draw that. If you already have Photoshop, or some other editing program, that’s good too. Look up tutorials online for doing pixel art in your program of choice, and go to town. I kept to a 28×28 pixel work area so I could fit it into a pendant later. I roughly sketched it up first (left), and then slowly filled it in and added shading and all that. 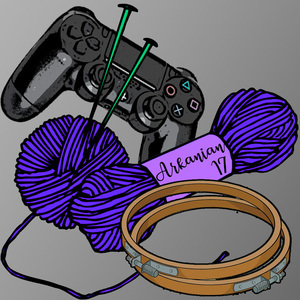 I used the muted colors from the ‘in game’ image, while keeping the general shape of the icon. This isn’t an art tutorial, so I won’t show you “The rest of the f*ng owl“, but I am showing you my general process to get an idea of what all goes into pattern design. 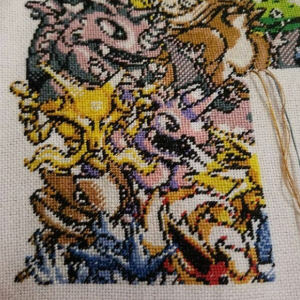 We haven’t even gotten to PCStitch and I’ve already spent an hour or two on this thing. You can also draw directly into PCStitch, Winstitch, etc. Though it’s not as time saving as you would think, honestly. But this whole process should be about experimenting and doing what works best for YOU. 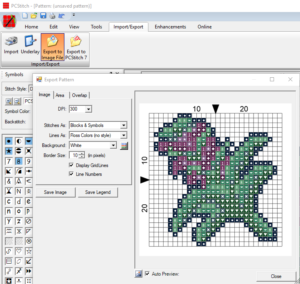 Plus, pixel art programs can’t account for backstitch, so if you’re doing backstitch heavy designs, it may be best to just draw straight into a cross stitch program. Pick out your file, click the ‘show preview’ button and… oh. Uh. What’s that blurry mess? So the most common mistake is not adjusting for size. Whether you’re importing a photo or a small sprite, you want to define how big the end pattern is going to be. 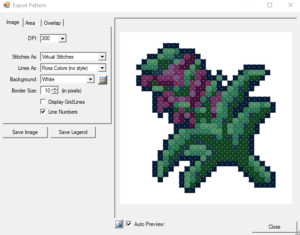 In this case, stretching a 28×28 pixel art up to 100×100 makes it look… well, awful. 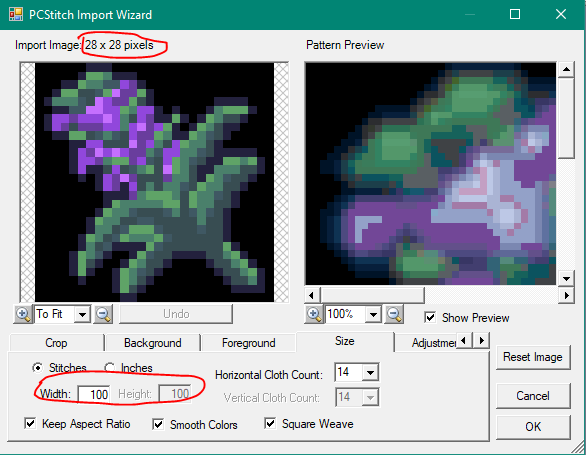 So for pixel art you’ll want to use the same size as the original design. For photos, you just want to make it whatever size you’re willing to stitch it as. Well, now you’ve got your image at the right size. And are thoroughly regretting choosing anything with purple in it. For now, simply make sure you’ve also selected your brand of thread from the Floss tab (in this case, DMC Stranded Cotton). 50 colors is more than enough for this little guy, but if you’re importing a full color photo or artwork, you may want to turn that up even if you’re not planning to keep all 500 colors; we’ll work on reducing colors later. Now that it’s in here, the first thing you want to do for most sprites is remove the background color. 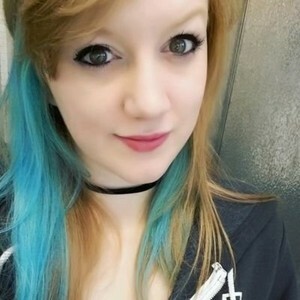 Since my image was transparent, PCStitch automatically filled it all with black. 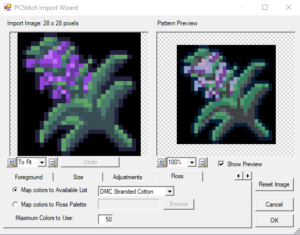 This is not great if your sprite already has black in it, so keep that in mind and make the background of your image a unique color so it’s easy to remove. Just right-click and delete. 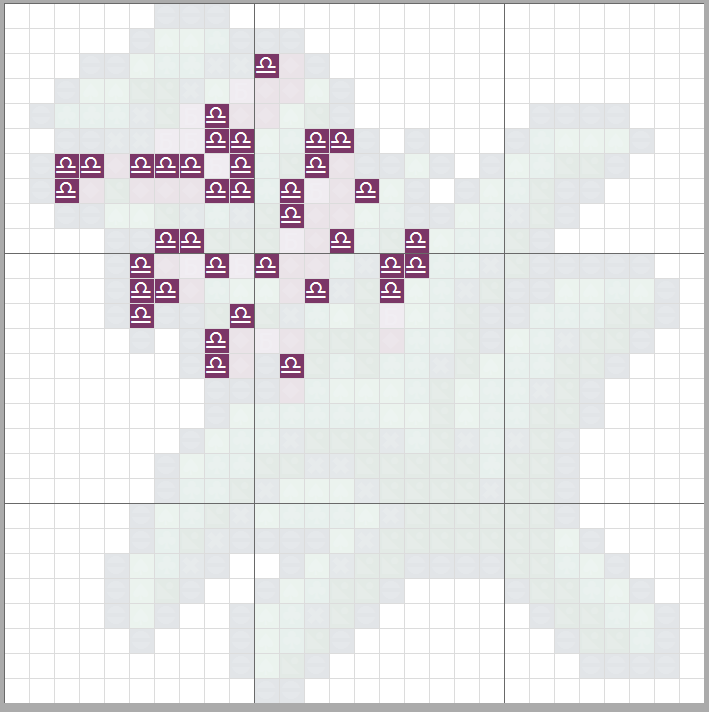 After that, one of the most time consuming parts of making designs is picking out floss colors. As you’ve seen, some colors look fine (The lighter greens), and others look awful. (the purples). 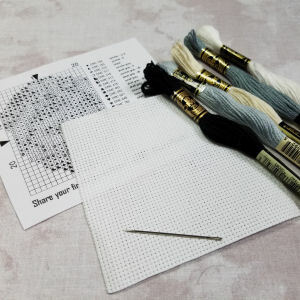 You’ll probably want to bring out your box of floss and look at some of these colors in person too, as cross stitch programs are notorious for not displaying some colors quite right. Just start going through and picking any colors that look wrong. Click the color you want to change down in the floss palette. Click the color you like in the ‘Available colors’ menu. Click the Replace button to replace all stitches of that color. Since I designed this with few colors in mind, I don’t have a lot to reduce for this example. However, when importing game sprites I often see colors that only have 1 or two stitches. Usually, anything less than 15 I’m going to investigate and see if it’s necessary. Sometimes it is, like two stitches for tiny eyes. Other times, I already have a very similar color next to it and can combine the two. This makes it real easy to see where those stitches are so you can replace them with nearby colors as needed. I also like to go through each and every color while in this highlight mode and see if there’s any stray stitches off by themselves. 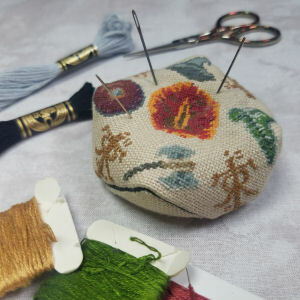 Even if there’s a lot of stitches of a color, no one wants to re-thread a needle for just a stitch or two. 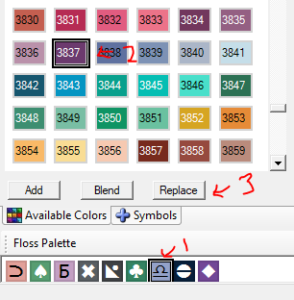 Once you’re done combining and reducing colors right click any color, go to palette tools and ‘clear unused entries.’ to get rid of any colors in your palette that have 0 stitches. One of my least favorite things about buying patterns online is discovering that some of the symbols are far too similar to each other. So you want to go through and make sure your pattern is legible. You can change how your pattern is displayed right up in the menu. I like to keep to simple symbols and make sure they’re not too similar to each other. If I have a design with a ton of colors and it’s harder to pick unique symbols, at least make sure any that are too similar to each other are at least not even remotely a similar color or in the same area of a pattern. That way it should be obvious to the stitcher if they’ve started stitching with the wrong color. Always feel free to call me out on it if symbols in my patterns are hard to distinguish. We’re almost there! Time to export the design. I like to include both a full color “Blocks & Symbols” version as well as a Black&White “Symbols” version. 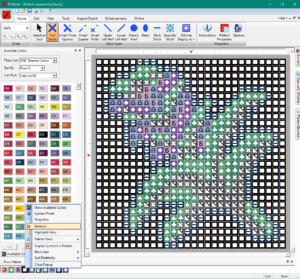 You might also choose to have a ‘Virtual Sitches’ version without the gridlines to show more or less what your design will look like once stitched. Arguably one of the most important parts of designing is actually stitching your patterns. Whether you do it, or end up getting someone else to test it, I encourage you to actually stitch it if you’re planning to sell your pattern. You’ll find that along the way a color doesn’t look quite the same in person, or looks different when placed next to another color. Or maybe the symbols were more similar than they looked in the program. Or you missed that one stray pixel off to the right that you’re too lazy to even stitch yourself. This is when a design truly stands out. When it’s been stitched and approved by a real life human. When I test stitched this one I ended up changing out two of the greens entirely, and made the border around it a dark grey rather than the 939 I had originally chosen. I also cleaned up a few stray stitches that didn’t quite seem to belong once they were stitched. This was tent stitched over 1 on 28 count fabric, and on fabric I ended up not liking because the holes weren’t well defined and it was harder to keep stitches even. Usually my tent stitching has much better coverage (IMO), but I still think it turned out pretty good! Total time from finding image references to finishing stitching was about ~4-5 hours. Sirithre wrote this tutorial. 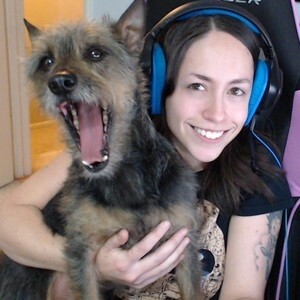 If you have additional questions about using PCStitch, feel free to ask her directly or ask in the Pixel Stitch Discord.